A regular low dose aspirin is a wonder drug for heart and circulation health as a long-range treatment option. Does daily aspirin regimen help lower risk of heart attack & stroke? 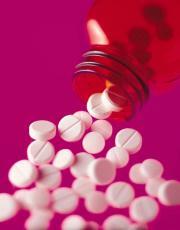 Taking aspirins occasionally for headaches, fever or body aches is safe for most people. Why does aspirin prevent a heart attack or stroke? Aspirin interferes with your blood's clotting action. When you bleed, your blood's clotting cells, called platelets, accumulate at the site of your wound. The platelets help form a plug that seals the opening in your blood vessel to stop bleeding. However, this clotting can also happen within the vessels that supply your heart and brain with blood. If your blood vessels are already narrowed from atherosclerosis — the accumulation of fatty deposits in your arteries — a blood clot can quickly form and block the artery. This prevents blood flow to the heart or brain and causes a heart attack or stroke. Aspirin therapy reduces the clumping action of platelets — possibly preventing heart attack and stroke. Click now for Health Tip of the Day. Should I go on a daily aspirin regimen? If you've already had a heart attack or stroke, your doctor probably talked to you about going on a daily aspirin regimen to prevent another heart attack or stroke. If your risk factors are high, but have not had a heart attack or stroke, you may benefit from going on a daily aspirin regimen. However, discuss with your doctor if it's safe taking aspirin daily. It's also important to tell your doctor what other medications or supplements you area taking, even if it's just ibuprofen. Taking aspirin and ibuprofen together reduces beneficial effects of the aspirin. Taking aspirin with other anticoagulants, such as warfarin (Coumadin) could greatly increase your chance of bleeding. Discuss with your doctor what dose of aspirin is right for you. Some studies have shown that low doses of aspirin — 75 milligrams, is less than a standard baby aspirin and can be effective. Your doctor may prescribe a daily dose anywhere from 81 mg — the amount in a baby aspirin — to 325 mg, which is a regular strength of aspirin. Any Risks if I stop taking aspirin every day? While you might know that taking daily aspirin helps prevent additional heart attacks or strokes, you might be surprised to learn that stopping daily aspirin therapy can have a rebound effect that may increase your risk of heart attack or stroke. If you've been on daily aspirin therapy and want to stop, it's important to talk to your doctor before making any changes. Suddenly stopping daily aspirin therapy could have a rebound effect triggering a blood clot. Can I take aspirin if I regularly take ibuprofen for another condition? Ibuprofen counteracts the benefit of daily aspirin therapy when taken together. Both aspirin and ibuprofen reduce the clotting action of blood platelets. If you need only a single dose of ibuprofen, take it eight hours before or 30-minutes after the aspirin. If you need to take ibuprofen more often, talk to your doctor about medication alternatives.